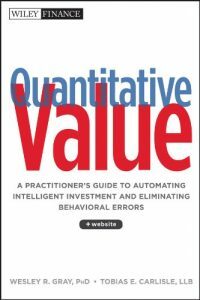 Quantitative Value Strategy – What is it? Quantitative Value is an investing strategy which selects for investment the highest-quality cheapest stocks using state-of-the-art computer algorithm. Our implementation of Quantitative Value has generated returns of over about 19% per year on average, with relatively low volatility, and low asset turnover. Establishing a universe of stocks to choose from, per an investor’s market cap preferences. The algo also eliminates the riskiest stocks from the universe (based on insights from vast academic research). Sorting the cheapest stocks based on composite Quality and Technical ranking system which include profitability and financial strength metrics, and selecting for investment the highest ranking stocks. Our Quantitative Value algorithm prunes thousands of stocks and performs fundamental and technical analysis on a scale which no human can do manually. The rules of the algorithm are based on tens of academic research papers and practitioner’s experience. We have tested the Quantitative Value model rigorously using state-of-the-art statistical techniques. There are many ways to implement a Quantitative Value strategy. Our implementation achieved average yearly returns of nearly 19%, with relatively low volatility and asset turnover. 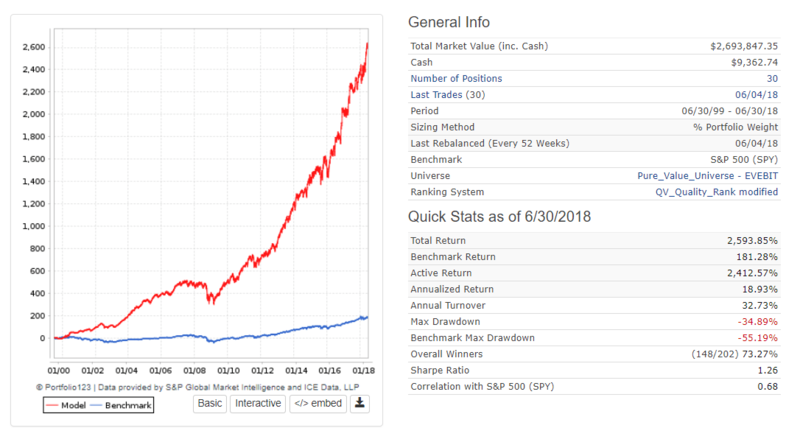 The following figure is an example of a 30-stock portfolio simulation (backtest) spanning 19-years between June 30th, 1999, and June 30th, 2018. Stocks have a lower market cap limit of $200M and are rebalanced once a year. Results are exclusive of taxes and transaction fees. 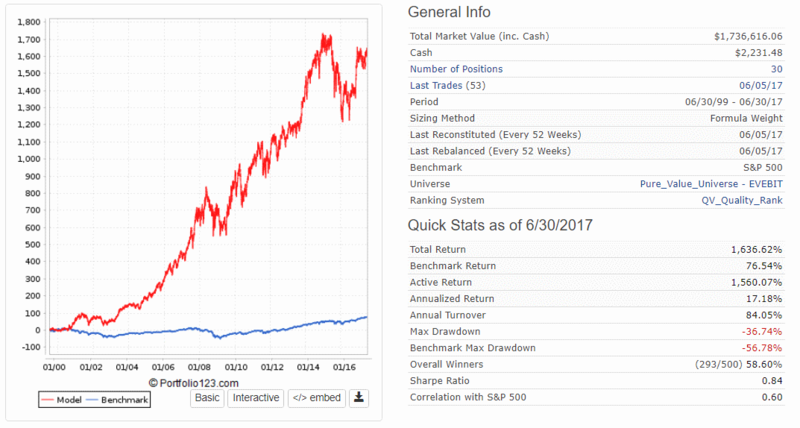 In the simulation example above, a portfolio of 30 stocks selected through our Quantitative Value algorithms, returned 18.93% per year vs. the S&P 500’s 5.59% per year (including dividends). Over the span of 19 years, our portfolio turned $100,000 into $2,693,847 whereas an investment in the S&P 500 would have turned the same $100,000 into a mere $281,000. Our portfolio was less volatile than the market, and its max drawdown, i.e., its largest decline was lower than the S&P 500, -34.89% vs. -55.19% for the S&P. 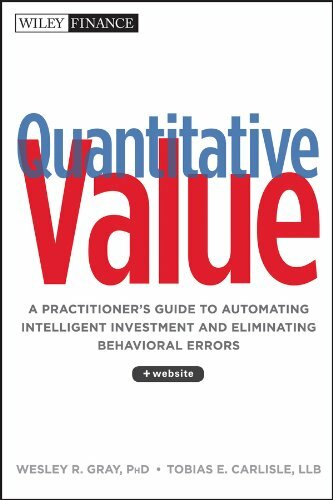 In their book, Quantitative Value, + Web Site: A Practitioner’s Guide to Automating Intelligent Investment and Eliminating Behavioral Errors, researchers and fund managers Tobias Carlisle and Dr. Wesley Grey provide excellent insight into their vast research on quantitative value investing methodologies. They start by re-creating the famous “Magic Formula” portfolio which was introduced by Prof. Joel Greenblatt in his book The Little Book That Beats The Market. The Magic Formula ranks stocks based on a combined metric of valuation (cheap stocks rank higher) and quality (stocks with high returns on capital rank higher). The Magic Formula portfolio is then constructed by buying a basket of highly ranked stocks based on the combination of valuation and quality. Carlisle and Grey have found that ranking stocks based on valuation alone results in even better risk-adjusted returns than the averaged valuation+quality ranking. They have also discovered that narrowing down the bucket of cheap stocks by selecting the highest quality issues among those cheap stocks, yield even better returns. The distinction between how Carlisle and Grey use the stock factors (often called smart-beta factors) of Valuation and Quality vs. how Greenblatt has, is nuanced, yet important. Greenblatt’s Magic Formula ranks stocks based on the average of their valuation and quality. On one end, stocks are ranked and sorted based on valuation – the cheapest stocks get the highest rank (e.g., 100), the second cheapest gets a lower rank (99.5 for example), the next gets a 99, then 88.5 and so on. On the other end, stocks are ranked again based on a quality factor, Return on Capital. The highest quality stock receives a rank of 100; the runner-up gets a 99.5, then 90 and so on. Each stock now has two ranks, one which represents its valuation and the other – its quality. The ranks are then averaged to result in a single Magic Formula rank. Naturally, very cheap stocks (high valuation rank) with high quality (high-quality rank) will rank highest overall and will be bought for the magic formula portfolio. But even very high-quality stocks with mediocre valuation may get a high enough combined rank to enter the portfolio. And so do cheap stocks with average quality. Thus, a well-diversified magic formula portfolio will typically include a mishmash of cheap and not-so-cheap stocks, some with above-average quality and some with mediocre quality. In contrast, Carlisle and Grey’s Quantitative Value (QV) model ranks stocks for value and quality consecutively (i.e., in series). The first rank is based on valuation alone. The QV model ranks and selects the cheapest decile (10%) of the universe of stocks, using a TEV/EBIT multiple. All the other stocks are discarded. The lower the TEV/EBIT figure, the cheaper the stock. A “Rank” is similar to a grade – the higher the rank, the better. A high TEV/EBIT rank corresponds to a low TEV/EBIT figure and a cheaper stock. The resultant cheap decile may still consist of several hundreds of stocks (depending on the lower bound set for market capitalization). The QV model then ranks the resulting set of cheap stocks for again, but in this second ranking, the rank is based on a combination of several quality metrics. The QV model then selects only the highest quality stocks for investment. In the Magic Formula, stocks are ranked once based on an average of quality and value. 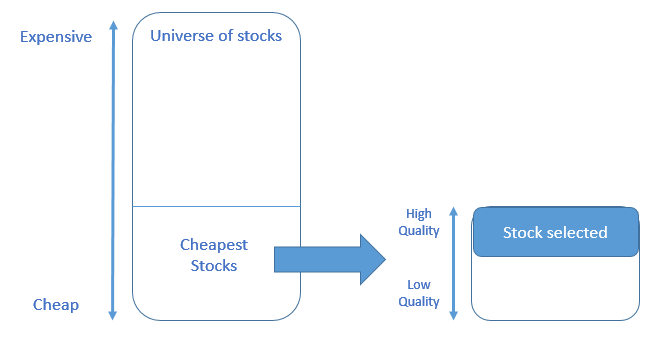 In the QV model, stocks are first ranked for value, with the expensive stocks discarded, and only then the cheap ones are ranked and selected for quality. Carlisle and Grey have found the QV model to yield better results with lower volatility than the Magic Formula. We have reached similar conclusions through our own testing. Can we do better than Carlisle and Grey’s QV model? We believe we can. In the example below, we re-create Carlisle and Grey’s model as accurately as we can using the tools we have at our disposal. The universe is comprised of stocks with a market cap in the highest 40% percentile. The portfolio consists of 40 stocks, value-weighted, and rebalanced every year. However, we must note that we cannot perform a 100% accurate re-creation of the original QV model. While Carlisle and Grey describe their QV model with unprecedented detail throughout their 300-page book, they do leave much room for an investor’s own interpretation. Carlisle and Grey do not disclose several parameters which are necessary to mimic their results. Also, while Grey and Carlisle insist that the QV model is simple to implement, we have found the implementation of some of their formula to be challenging using retail platforms, such as Quantopian and portfolio123. Constructing a QV-like model using Portfolio123 required some math and heuristics to simplify the formulas and fit the platform’s constraints. As shown above, the average performance over the span of 19 years is quite good. The QV model handily beats the S&P 500, with average annual returns of 17.18% vs. 5.13% for the benchmark. Sharpe is 0.78. Asset turnover is high at 84.05%, meaning that nearly all positions will be replaced with every yearly rebalance. We shall now show how we improved the model. Volatility is high, at 19.15% since inception, vs. just 14.62% for the s&P 500. Max drawdown is -36.74%. Our goal in designing the proprietary modifications was maximizing returns with the lowest volatility and lowest asset turnover possible. High volatility is undesired. Even the most experienced investors will find it hard to digest. Volatility spurs emotions which are hard to control, causing investors to exit positions immaturely. Therefore, reducing a portfolio’ volatility has a direct effect or investors staying power. A high rate of asset turnover is also undesired. Selling stocks involves transaction costs as well as increased tax bills (for taxed accounts). We wish to decrease the number of transactions (and turnover) to the necessary minimum and thus increase after-tax after-fees returns. Our first improvement was to change the portfolio from being value-weighted to being equal-weighted. In value-weighted portfolios, the size of a holding is determined by its market cap, relative to the other stocks in the portfolio. Higher market-cap stocks will comprise a larger portion of the portfolio than smaller market-cap stocks. In contrast, an equal-weighted portfolio, each holding is initiated with equal weight, an equal portion of the portfolio. Equal-weighted portfolio makes more sense to us, as we do not know apriori which stocks has a better chance to perform well, compared to other stocks in the portfolio. We must as well give every stock an equal opportunity to influence the portfolio’s results. Also, academics claim that equal-weighted portfolios earn more than equivalent value-weighted portfolios since they are more exposed to the small stocks effect (SML), in which smaller stocks have a higher likelihood to perform better than larger stocks. Our second improvement was to modify the ranking system, which is used for the third step of the algorithm, to include not only Quality criteria but also technical criteria. We’ve added the stocks’ historical beta and another measure of price smoothness to the ranking system mix. We rely on academic research showing that lower-beta stocks deliver higher returns and that stocks which are less jittery also perform better. The last modification is to our Sell and Rebalance rules. Upon every yearly rebalance, instead of selling all the stocks which are not the highest ranking stocks based on quality, as did Carlisle and Grey, we sell stocks based on their TEV/EBIT valuation. If the stock TEV/EBIT rank is NOT in the cheapest three deciles (30% cheapest stocks of the universe) – we sell it. If the stock is still cheap compared to the universe (present in the 30% cheapest stock), we keep it. This rule reduces the asset turnover rate, which results in less tax liability and fewer transaction costs, contributing to after-tax after-fee returns. Here are the results of the modified portfolio, consisting of 30 stocks with a market cap in the highest 60% percentile (>$200M), equal-weighted, rebalanced every year. Annual average returns are slightly higher, at 19.19% vs. 17.18%, yet the volatility was reduced considerably, now at 13.33% vs. 19.15% in the original model. Sharpe ratio thus increased from 0.89 78 to 1.26. Asset turnover was reduced from 84.05% to 31.67%. With the new sell rules, only a third of the portfolio is being replaced in every annual rebalance, corresponding to an average holding period of three years. These new rules contribute to reducing tax liability and transaction costs. They thus help to maximize after-tax after-fees returns. Where our unique modified QV portfolio really shines is with smaller market-cap stocks. We will now look deeper into one such portfolio. How would the QV model perform year-over-year? Month-Over-Month? What performance should we expect? Let’s dive deeper into the past performance of the QV model to search for clues. In this section, we shall refer to a common implementation of our proprietary QV portfolio, one with 30 stocks of market cap larger than $200M, equal-weighted and rebalanced yearly. Such a portfolio is easy to implement by both individual investors and small money managers. Having only 30 stocks allows most investors to leave aside some capital to complement this value portfolio with a momentum portfolio. First, let’s examine the monthly return during the last year and yearly returns since the portfolio’s inception. It is evident that the portfolio performance has a low correlation to the market on a month-to-month basis. In some of the months, the QV portfolio earns higher monthly returns than the benchmark, and in the other half, it earns lower returns. On a year-to-year basis, the picture looks different. 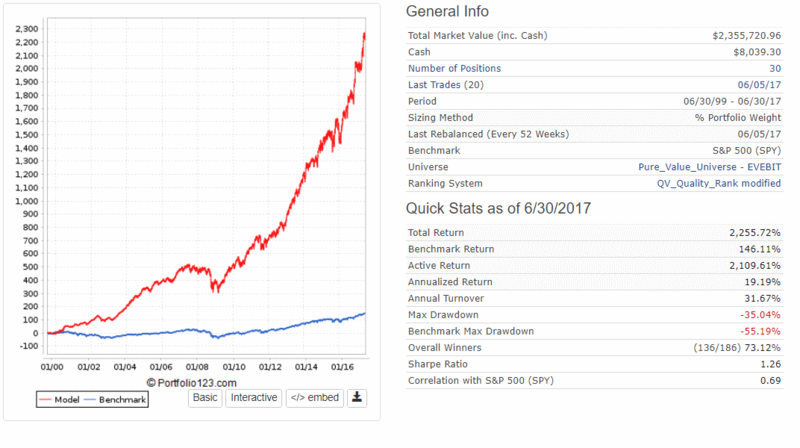 The QV portfolio beats the S&P 500 benchmark in 14 of the 19 years we simulated. Nevertheless, during 1999, 2007, 2009 and 2012, it lagged the market. Holding a QV portfolio thus requires a long investing horizon. It cannot beat the market in every single year. It works because it doesn’t always work. Let’s now deal with the volatility of our QV portfolio. Volatility corresponds to the extent which the total portfolio value fluctuates relative to the market’s fluctuations. Investor measure volatility through the standard deviation of the portfolio value. A high measure corresponds to higher volatility. Volatility should not concern rational investors with long investing horizons. Those should be able to ignore short-term capital value gyrations. But, as humans, volatility DOES play a role. Many find it mentally challenging to hold a portfolio which suffers steep declines and may lag the market by 10%, 20%, even 30%, even if only on a temporary basis. The % Drawdown measure (in y-axis) reflects the extent of the decline compared to the peak price achieved. Only rarely the QV declines more than the benchmark. Most of the time, the QV portfolio declines less than the S&P 500. Albeit the lower volatility, QV still beats the S&P500 by a large margin. The QV portfolio has always managed to recover and surpass the benchmark. Lastly, we would like to perform a rolling test. Our rolling test was conducted by creating a new portfolio every month since June 1999 and letting it run for one year. The first portfolio was set up in June 1999 and ran for a year. The second portfolio was created in July 1999. We repeat the process for August 1999, September 1999 and each consecutive months, up to the period October 2017 – October 2018. 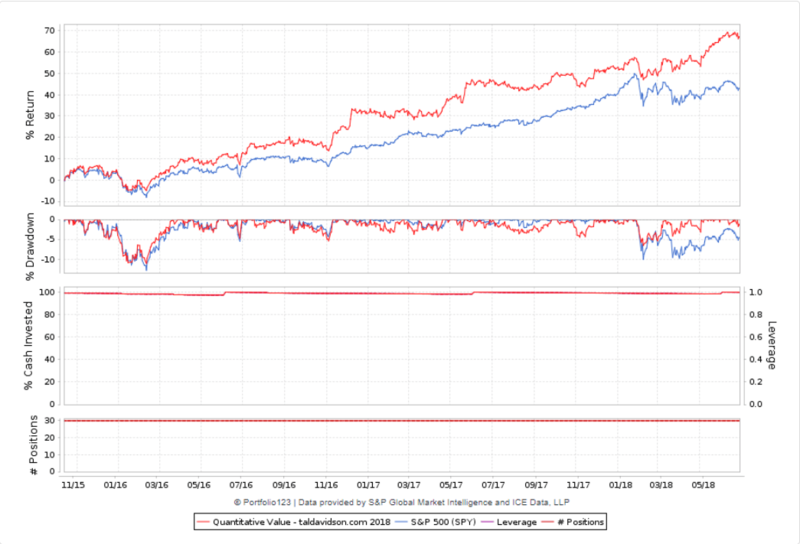 For every such test, we recorded the returns and Sharpe ratios and compared to S&P 500 portfolios of the same duration. We repeated the process for test durations of two years, three years and five years. The y-axis denotes the excess returns of the model over the S&P 500 for portfolios that were held for one year which ended on the date indicated by the x-axis. Sharpe ratio is a measure of risk-adjusted returns, yielding in a higher figure for higher returns, but also a higher figure for lower volatility. Higher Sharpe in better. A positive Sharpe excess over the S&P 500 is desired, while a negative excess Sharpe means that either the returns lag the S&P 500, or that excess returns are gained through excessive volatility. It’s evident that during 2012 – 2018 QV-like portfolios were not always such a great deal when held for one year. Let’s now examine longer holding periods. Examine those results carefully. The QV model shows a continuous monotonic degradation in its out-performance, as measured by 3- year and 5 -year excess returns and excess Sharpe. During 2012-2018 it was getting harder to beat the market, even with a 3-year and 5-year holding periods. QV portfolios still win and earn higher returns, but with a lower margin. Decades-long research shows that Value investing sometimes beats growth investing and sometimes lags it, but in the long term, value always wins. Periods in which Value underperforms, are always followed by periods when Value overperforms. 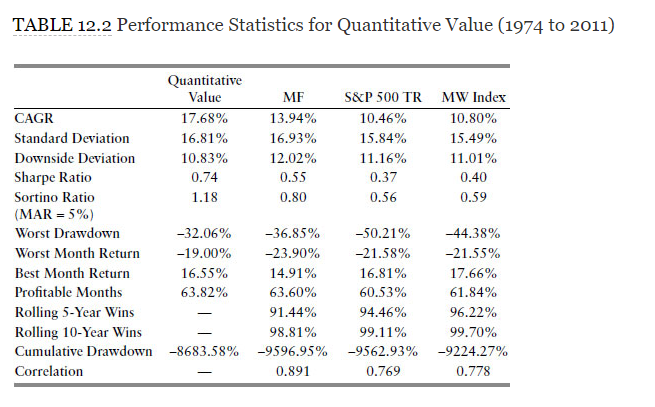 Similarly, the QV portfolio relative performance is likely to improve in the future. Yes, the S&P 500 was a fantastic investment during the last few years, and much of its return is attributed to FANG stocks (Facebook, Amazon, Netflix, Google) and alike. Those growth stories cannot last forever. Sooner or later the S&P 500 will run out of steam. When that happens, Value will shine again. At that time, you want to be invested in a group of high-quality cheap stocks (selected by the QV model) and not in the S&P 500. After several years of value performing on par with the market NOW may be one of the best times to invest in value. *results based on simulation (backtesting) of 19 years between June 30th, 1999, and June 30th, 2018. Simulation results are NO indicator of future results.